There’s plenty to consider when you take on the task of moving to another state: jobs, schools, doctors, groceries, gas, and plenty of other lingering uncertainties can make interstate moves especially challenging. However, when you’re making the interstate commute with a pet, moving day may prove to be a little more challenging than you anticipated. When moving with a pet and making an interstate commute, there are special considerations you’ll want to make beforehand so that you can simplify the process and make it a bit easier on yourself. If you have too much on your plate already, you may want to pass this list of considerations along to someone you can delegate the task to. Here are some things to think about before, during, and after the trip that will help you and your pet through the commute and transition. As you plan your route to your new home or new destination, you’ll want to make special note of what’s nearby and where you can stop for stretching, bathroom, and exercise breaks – for both you and your pet. Look for pit stops where you’ll be able to safely let your pet smell you smells and get a little fresh air. You’ll never know when you’ll need proof of your pet’s licensure, medical documentation, or health records. It’s important that you’ve packed them in a safe, accessible place in your car during the trip. Just as important as preparatory research and planning before the trip, during the trip you’ll be faced with a few things to keep in mind as you help your pet through the commute. A pet seatbelt or a crate will do just fine to keep your pet secure while traveling. Ultimately, it’s important that you follow your state’s guidelines on pet transportation and keep your pet as comfortable as possible. Don’t forget to keep a ration of your pet’s food and water in the car at all times during the commute, as well as a few treats. Set reminders for when your pet should be let out of the car and when they need to be fed so they don’t get forgotten in potential chaotic situations. Blankets, bedding, and towels will help your pet stay cozy during the long commute and will promote a relaxing journey for them. Your pet’s toys are part of their comfort; in unfamiliar territory they need to be reminded of the familiar. Comfortable items help, but just as we do, pets need time to relax, be goofy, and unwind. Make sure your pet’s medication has been filled and is up-to-date. You will want to find a veterinary clinic in your new location to bring your pet to so that they can be caught up with your pet’s needs and health history. The commute can be the most difficult part of bringing a pet to a new location, but it’s also important to make sure the transition goes smoothly as well. As we mentioned before, it’s important that you schedule a veterinary visit with your pet as soon as possible after your move. This will ensure your pet’s health and help familiarize them with their new healthcare provider. Dogs especially like to become familiar with their new territory. Be sure to set time aside to walk them around the new location – this is a good chance to relax yourself as well! Pets take time to adjust to new surroundings, just like humans. Keep an eye on their behavior and follow up with a veterinarian if you have any concerns about their adjustment. 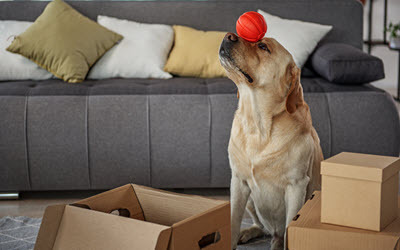 As a professional moving company, helping clients from Santa Clarita and the greater Los Angeles, CA, area for over 2 decades, we have plenty of tips and suggestions for helping your pets through the moving process. For more information, or to learn more about our business, please contact one of our helpful professionals today.